The compressor Duty Cycle is quite an important piece of information to have when you are sizing an air compressor for your home or business workshop. Some models of air compressors are not designed to run continuously. If you plan on using your air compressor for extended periods then duty cycle of that make and model is something you need to know. Some compressors need to have a rest period of a certain percentage of their operating time, to give the compressor time to cool down. You want this to happen, to prevent breakdowns and to prolong the life of your compressor. Usually, the duty cycle is expressed as a percentage of a certain time frame, often a 10 minute segment. 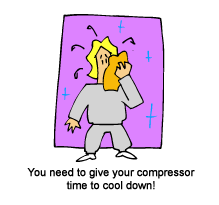 Overheating when working too hard happens to compressors too! A duty cycle of 50% for a particular brand and model of compressor would mean that this particular unit could run steadily for 10 minutes, and then it must have a 10 minute rest period before it kicks in to compress more air. It is often the home shop DIY that gets caught in the compressor duty cycle trap, not knowing what the duty cycle of their compressor is, and burning it out through too prolonged use during one session. My home compressor needed a 30 minute continuous run, with the receiver drain wide open to atmosphere to break in. Others need 15 minutes. Your compressor manual will tell you the break in period. I therefore assumed (maybe a mistake…we’ll see?) that the duty cycle on my unit would be 30 minutes, and I take pains to ensure that if it ever runs for 30 minutes at a stretch, to shut it down and let it cool for that same amount of time. Industrial compressor users are normally purchasing compressors through an industrial supplier or from the manufacturer, and the sales people for those firms are professionals. They should make sure that the buyer gets the right unit. Industrial compressors frequently have a 100% duty cycle, meaning they can run continuously without a cool down period, a feature that is necessary for high-production compressed air use. Check carefully. A compressor that shows ample flow capacity for your air grinder might run well beyond its duty cycle when it is being used on a big job at home. This will inevitably lead to maintenance issues which are avoided by being sure of the duty cycle before you buy and when you use your air compressor. The manual that comes with your compressor should indicate the duty cycle. However, mine did not. That is inexcusable, in my view. If you are not sure about the duty cycle of your air compressor, and you plan to use your compressor for long periods of time, see if you can get the manufacturer’s name from the store and email them to ask about the duty cycle for the model you are contemplating buying or using. Is it Continuous Duty Cycle For Sure? In recent years there is a trend to vendors offering air compressors that claim 100% duty cycle. If those models are not industrial designed compressors, be careful. For those models, this statement does not mean that you can run the compressor all day without harm. For these compressors it is better to take their claim for a 100% duty cycle and interpret it to mean that this particular compressor is suitable for limited extended use, but NOT for running all day, flat out. Anymore, if the compressor manual says that a model is a 100% duty cycle and it’s a smaller, do it yourself type air compressor, better read the fine print. My bet is that it will not be a true 100% duty cycle, as in you can run the compressor for long periods without damage. Got a question about compressor duty cycle? Please add your question here, and be sure to upload photos as they almost always help others help you with your compressor issue.